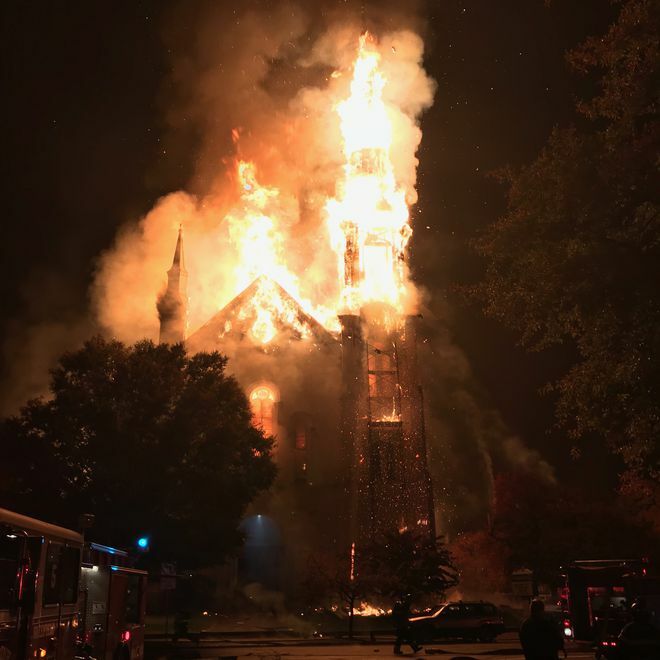 An historic church in Wakefield has been decimated by Flames Tuesday evening, as firefighters struck seven alarms to call for additional help. Wakefield police asked pedestrians and vehicular traffic to avoid the downtown area surrounding the 150-year-old First Baptist Church, located on Lafayette Street, while firefighters worked to extinguish the blaze. The cause of the fire has been said to be a bolt of lightning which struck the building. There was a bit of smoke before fire eventually engulfed the building, according to a witness. Photos and videos from the scene showed heavy smoke and flames emanating from the traditional white church and steeple. As the orange flames climbed the steeple, the ribs of the structure became visible. The fire was so huge that some witness said they could see the smoke and flame from neighboring town.